Can someone explain the following paragraphs regarding the pyramid article? following paragraphs.Can someone explain this to me? Οf course this begs the question of how the field is summed. If an object on the Earth is not part of the Earth, and even an object buried near the surface is not part of the Earth, what is? I give a more complete answer to this elsewhere, but the last paragraph begs its so obviously I feel I have to give a short answer here. Every object both emits and blocks the foundational E/M field. Every proton and every electron, every house and every planet and every sun. Every apple and every orange. The density and size determine both the emitting and the blocking, but they determine each in a different way. Say that our pyramid and the Earth are the same density. In that case, the Earth must be emitting much more than the pyramid, per unit area, simply because the Earth has a lot more mass behind every unit of area. Each part of the Earth blocks some of the emission behind it, but not all, so that at the surface of the Earth we have a summation of all the mass behind that surface (minus the blocked emission). This is also true of the pyramid, but the pyramid has much less mass summing behind each surface. So the Earth must have exponentially stronger emission than the pyramid, even with equal densities. You will say that the pyramid, having only one density, must block as much as it emits, keeping the field the same above and below it, but this is not true. Any object must block more than it emits, so long as the blocked field is denser than its own. This is because it is blocking through its entire length and width, but it is emitting (in a summed sense) only from its surfaces. I say summed sense, since it is true that all quanta in the object are emitting; but the emission of the object as a whole is not a straight addition of this quantum emission. Just as with the Earth, outer parts of any object will block inner parts; and so not all parts of the object will be represented by surface emission equally. For this reason, objects block more than they emit under these circumstances. This also explains why objects at or above the surface of the Earth act independently in many ways. As long as they have discrete surfaces, and especially if they have greater densities than the Earth, they must act independently of the main summed field of the Earth. Which is to say that they must alter the field that is emitted into the atmosphere in measurable and detectable ways, by changing the charge pressure as it rises and spreads out. With objects above the surface (like our pyramid) this is easy to see: the pyramid must block more than what is around it, since it is surrounded by air on four sides. With buried objects, this could only work if the object had a greater density than the Earth around it, or had other distinguishing properties that would cause a change in charge pressure. Re: Can someone explain the following paragraphs regarding the pyramid article? Hi Panagiotis, welcome to the forum. We're always glad to help, where we can. I think the important part of these paragraphs is that the pyramid blocks more than it emits. The results specified are not a result of the size or density of the pyramid but rather the fact that any solid body will block more than it emits. This is because the whole body blocks, since the incoming charge can get inside of the body, but only the surface emits. Even though it is the whole body that is emitting charge, the body blocks its own charge just as much as it blocks the Earth's charge (well, not always the same amount since you need to know where the emission is starting and it will only be blocked on its way to the surface(s)). Imagine you are at a concert and you are standing in the middle of the crowd. From the rear of the hall, the security team start shining torches into the crowd, but only at chest level. Being in the middle, none of that light is likely to reach you because it is blocked by all of the other people between you and the torches. If you had your own torch, it is also unlikely to reach anywhere outside of the crowd for the same reasons. However, if everyone in the crowd has a torch, then those people near the edges (surfaces) would be able to get light outside of the crowd very easily. Therefore, the crowd has blocked nearly all of the security teams light but the crowd is still able to emit light into the surrounding areas. If we made the crowd into a triangle shape, with the point being at the stage, then it would be easier for you, in the middle, to reach the apex of the triangle, or somewhere along the edges near the apex, with your torch because there is less people between you and the edge. Certainly easier than the security team emitting light from the base of the triangle. Therefore, a pyramid will create a charge well that has less density directly above the apex and increases in density towards the areas above the base. Welcome Panagiotis. I agree with Nevyn. 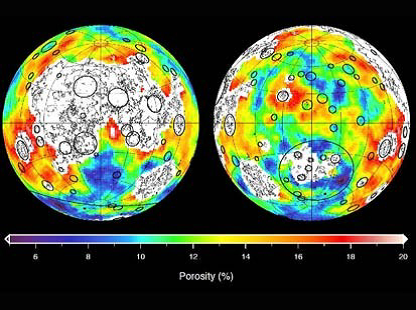 I would suggest you follow up with Miles’ paper, NASA's Lunar Gravity Maps. The emission fields of all objects are unique. Gravity is the sum of solo-gravity and charge, objects of differing charge densities can be observed from gravitational measuring satellites. The two images below are from that paper, they show (or as Miles points out – the white areas hide) a great deal of surface, or near surface, charge density variation. Even without that information, NASA should have been able to figure out that its method of mapping was only mapping the surface. As soon as the physicists saw red circles surrounded by blue circles they should have known they were only mapping the surface. By the current theory of gravity, how could surface craters follow overall gravity so perfectly? They couldn't. There is absolutely no mechanism by which interior or overall gravity could be caused by surface craters. These maps are clear confirmation of my field and clear refutation of theirs. So according to this, the bulk density data comes from GRAIL and nowhere else. The porosity map was generated from three sources, we are told, but the bulk density data came only from GRAIL. I have just shown that GRAIL is only mapping the very surface, so this data by itself can tell us nothing about the Moon's crust down to depths of 33 miles. Craters don't create density variations down to 33 miles, and even if they did, we have no indication this is what GRAIL is mapping. As I said, GRAIL is clearly mapping surface anomalies. We can also see this by looking at the altitude of the satellites again. They are trying to map the crust of the Moon down to a depth of 33 miles, with satellites that are only 34 miles above the surface. Obviously, they need satellites that are higher than that, to give surface anomalies like I am talking about time to dissipate. The deeper you wish to probe the interior field, the higher your satellites have to be. Otherwise surface anomalies will wash out all deeper data, as we see here. 203. 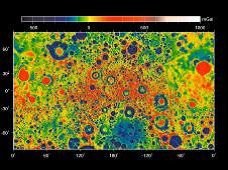 NASA's Lunar Gravity Maps. These maps are currently misinterpreted, and I show you the correct interpretation. By Miles Mathis. 10pp. Welcome to the forum Panagiotis. Just wanted to add these links back to the TB forum. I think the pyramids were a giant ionizer that could be loaded up with Nile water by the temple priests. MM provides an explanation of how the charge field may work with "basins" to create a rain-ready atmosphere. Yes a trickle charge may have been involved as well. Makes me think of the on/off phenomenon of water on surfaces by a trickle charge creating reversable tribo-electricity attraction. If you were a temple priest back then you could use the pyramid with MM's ionization to create rain on demand by a trickle charge on the pyramid. With the power of creating rain-on-demand, then you have a lot of power and people would follow plans for building a really big pyramid. (Just a theory at this point.). Miles said there's a relative charge minimum over the pyramid. A voltage differential must exist between the pyramid's center and surface. I was hoping for something more dramatic. Cr6's idea, Rain-on-demand! sounds more exciting. The pyramid acted as a giant ionizer. A trickle charge is all that's necessary to create rain-ready atmospheric conditions. Would metal-cladding the pyramid increase its performance? I have a pyramid theory too, the pyramid is a high pressure ram pump system (search TBolts?) pushing water to the higher irrigation reservoirs. At the same time it generates almost a hundred thousand atmospheres of cycling air pressure (0-100) to the piezoelectric blocks in the King's and Queen's chambers. This creates base carrier signal allowing long range communication around the planet. One need only modulate a key piezo crystal to transmit signals. In case you noticed, I deleted Cr6's post from Tuesday, 6 March 2018 at 3:16 am. This entry must have been an error. The same geopolmerolig... subject started again on a separate thread a few minutes later.